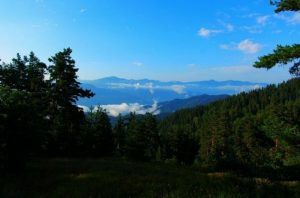 Borjomi-Kharagauli National Park was created with the aim of preserving the diversity of wild nature areas, especially its virginal mountain forests. Hiking through the northern part of the National Park (Kharagauli District) up to 1000m, you will find yourself in a mixed broadleaved forest composed of chestnut trees, beech and hornbeam with intermittent alder trees, lime, colchic oak and others. The evergreen understorey represented by rhododendron, cherry laureland others of the colchic forest lend them a distinctly subtropical appearance. Going up to 1400m to the middle part of the forest zone you will see beech forest and mixed coniferous-broad-leafed forest groves. This part is especially picturesque at the end of October and beginning of November. On the upper belt of the forest zone (1800m), dark coniferous forests composed of spruce and fir prevail. In the gorges of the southern part of the National Park the distribution of elements of colchic vegetation is greatly reduced – instead, oak and pine tree forests are developed. Visitors who climb up to the subalpine zone of the National Park (1800-2200m) can observe subalpine forests and bushes composed mainly of rhododendron, subalpine meadows marked for their colourful variety, and subalpine tall grasses. Birch, Mountain maple and mountain oak as well as pine forests are well developed.